In today’s world kids don’t get enough exercise. This is a fact. There are far too many distractions for them. With a combination of video games and fast food fads we have an epidemic of low activity, and because of that, childhood obesity. Naturally many parents are extremely concerned about their children, and want to keep them as active as possible. A great way to do that, as well as keep it fun for the kids, is watersports. There’s a huge range of watersports available for your children to try, wind surfing, water-skiing and kayaking to name but a few. 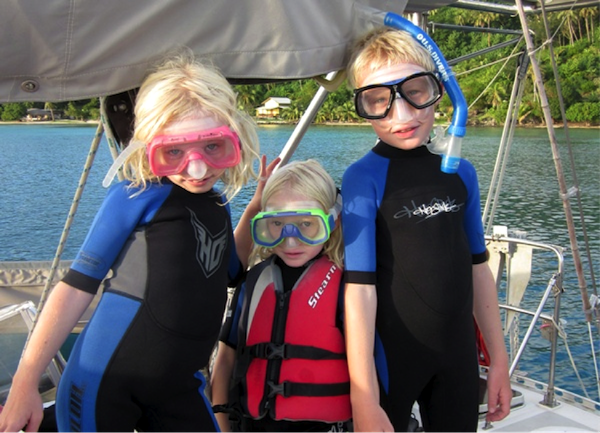 There are many reasons why getting your kids into water sports is a great idea, here are just three of them. As we’ve mentioned above, there is an obesity crisis that is about to explode. More and more kids do nothing but look at a computer screen all day. No-one wants their child to become one of the statistics, so you need to keep them active. 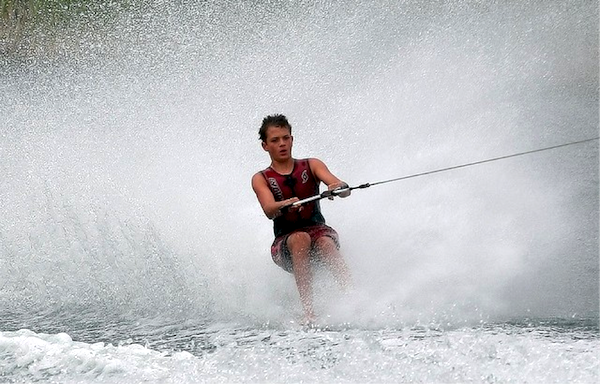 Watersports are a great choice if you want to keep your kids active. They won’t even notice they are exercising because they will be having too much fun. If it is a sport they develop a genuine enthusiasm for, like many kids do with watersports, then they are much more likely to want to do it all the time, which will lead to them staying fit and healthy long into the future. Staying fit and healthy while they are young will help prevent heart disease and other conditions as they get older. Another common complaint about ‘the youth of today’ is that they are lazy and have no discipline. While this is probably an exaggeration, it is certainly true that learning discipline and hard work at a young age can help them later in life. The world depends on hardworking people, and hardworking people tend to be more successful, so anything that can teach them hard work and discipline at a young age is of great benefit. Watersports are ideal for this, because they aren’t easy, and they take a lot of time and effort to master. This means that kids who want to master them (and most kids do), have to work hard, and develop a certain level of discipline. This will help them significantly, as they will now have the skills to work hard during school, university, and beyond. Of course, it is difficult to instil the ideas of hard work, discipline, and keeping fit into kids. That is why they need something fun to ensure that they take on board the ideas that you are trying to teach them. This is where watersports come in. From the first moment they get into a wetsuit they are going to have fun. They won’t even notice they’re staying fit and learning vital new life skills. They will also thank you for giving them the opportunity, which will help improve your relationship with your child. Finally, socialisation is vital for kids. They need to gain friends from a large variety of different backgrounds. So, allowing your child to do watersports, especially in a group, will enable them to make friends with similar interests and improve their social skills. To get geared up for your watersports adventure visit www.h2o-sports.co.uk for kids wetsuits and more. Get your little ones off of the couch and into the water today. I find it sometimes hard to strike a balance between “providing opportunity” and “push” to surf with my 12-year old son. When he’s out he almost always enjoys it, but at times he prefers to stay home to play a video game above surfing. Also, I think he’s now in the age to go surfing by himself (we have board storage on the beach), rather than I’m always taking him, but he hasn’t done this yet. Although he knows some kids of his age that surf frequently, he’s not part of that gang (yet? ), but I think this would be the best motivator to surf with mates. Tough call, but I think you’re right – it’s better to provide the opportunity and make it easy for them to go when they want to, rather than push them into going. 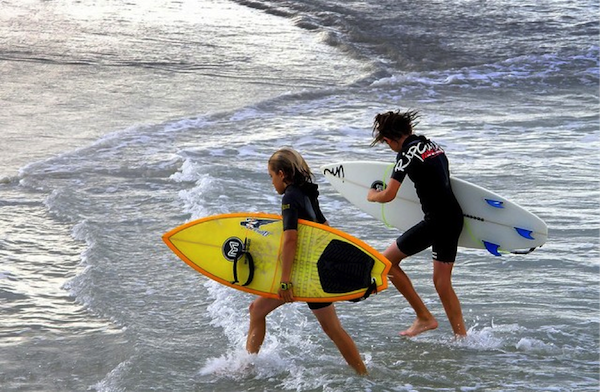 There’s no doubt having friends that want to go surfing is a great motivation as well. Of course he might just be at that age where anything you say or do will be met with teenage angst. Personally, I’ve spent the last 5 years trying to get my daughter into surfing and not had much success, but I haven’t put her off either so there’s hope. I met Tom Curren last year and asked him for his top tip for getting kids to surf, he said “take them to Hawaii”. You can’t ignore advice from a legend! Please keep checking back, I’m compiling lots of top tips on teaching kids to surf from various surfer dads. I plan to post the results oon. If you have any tips your self please let me know. Please keep checking back, I’m compiling lots of top tips on teaching kids to surf from various surfer dads. I plan to post the results soon. If you have any tips your self please let me know. We have also been very fortunate to have lived in Perth, Australia for 7 years. Back in Holland for 3 now, and it is of course less appealing to surf in North Sea slop in 6° of water…. One other thing I guess helps as well is to not focus on one sport, but my son also windsurfs, skateboards and plays football. I look forward to some more feedback on this subject, also from other parents. Off to NW in in a few weeks, hope to score! Yep, I reckon it’s hard to be inspired by cold North Sea slop when you’re used to surfing West Oz (my favourite waves). Especially if he’s into other things like windsurfing, skateboarding, etc. Maybe a few little father / son surf trips (Morrocco?) could stoke the surf flame.